Apple has made a variety of extremely successful products in various categories and this has allowed them to build up a great ecosystem with loyalty from a lot users and developers. This is very important as Apple has a lot of power to give any product it makes a huge app boost. There are a lot of Apple products which are both good and bad, but one thing that’s unanimous among all of them is that they have a booming App Stores. The gaming industry looks like a very lucrative business, which Apple is yet to try its hand at, and is driven by big name developers with games of stunning quality that pushes the hardware of these machines to the limit. Apple has shone that it can build great hardware and it can rally support from developers to build high quality games for their gaming device. The gaming market is huge and has sold a ton of consoles to people. The Xbox 360 and PS3 have roughly sold around 75 million each. The Wii absolutely killed it with over 100 million units sold, mostly around launch.These are huge numbers which result in huge revenues, but they absolutely pale in comparison when to see that Apple has sold over 500 million iOS devices, each with an App Store that has access to 800,000 apps going strong. You could argue that this is because iOS devices are multipurpose, but so are consoles now. I use my Xbox to stream Netflix and use IE more than play a game. A large number of these are games, which have sort of made the iPod Touch. They are obviously more casual games that we can’t compare to Crysis 3 or any console game for that matter, but the debs have shown that they can make high calibre games with relatively mediocre silicon (in terms of consoles). The Infinity Blade franchise showed us this and now the latest game to drop our jaws has been Real Racing 3. The graphics are absolutely stunning with high level console techniques applied here. It’s a statement that Apple can get high calibre games for a console. Apple could even experiment with a new Apple TV box that has like an A6X or unreleased A7X processor, and then open the doors to a new TV app store with the same system where Apple take a 30% cut. It may not on the level of the next gen consoles, but it could get close the likes of the Xbox 360 and PS3, and I feel that there could be a chance of it surpassing the Wii U. Getting into specifics the A-series processor they use could run much, much faster than it’s phone and tablet straggled brothers, because there can be a fan and while that sounds useless, it can make a huge difference. It allowed the Ouya to run its Tegra 3 chip at 1.7GHz all the time without scaling down the speed. Apple doesn’t even have to use its own chips, they could throw in an AMD or Nvidia card both of which they have used in various Macs. I want to see Apple inter ate their idea of AirPlay and also take advantage of those 500 million iOS devices out there. There probably won’t be a chance of 4K output, but with Apple’s view of the future being Retina displays, it’s not to far down the road. Don’t think Xbox or PlayStation, think Ouya. This may not be the high power blow-your-mind console but it could be the Ouya for iOS. That’s the most plausible way to think about. Don’t think Xbox or PlayStation, think Ouya. It was crazy. The Ouya sold 63,419 units in a matter of 30 days on Kickstarter! It got $8.5 million in a month. 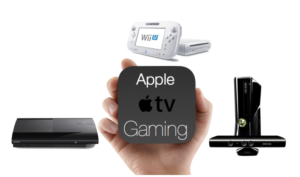 Now think of an Apple TV equipped to be a power gaming device with a price tag of $99-$149. You just hook it up to your TV, which can range from $500-$25,000 depending on how rich you are, and off you go logging into your iTunes account which will sync up all your data and bam, you are good to go. Just go to the App Store, using your iPad, and buy Real Racing 5 for $15. Since this is a more mobile approach to the console, there can be in-app purchases and the freemium model can work. It’s true that freemium is a hated model by consumer, but of late I’ve myself have noticed it being less obtrusive like in RR3. You can pick up games for free or $10+. That seems like a great deal for someone just looking around to get a console and just blow off some steam once in a while. As you can see, it’s a very popular idea for Apple to take the gaming spec by storm. There are tons of developer advantages which will be to the hardware’s success. For example, to develop for Xbox you need to be a certified developer by paying $10,000/year with a lot of legalities and in the endMicrosoft can veto your games. Apple on the other hand is more straight forward way with $100/year cost which would cover all iOS app development with the added benefits: there aren’t any legalities and you will almost always get through to sell your app as long as it’s within App Store guidelines. What do you guys think? The mobile approach to gaming seem to be the way in my eyes and also in the eye of others. I feel that the PS4 and the next Xbox aren’t enough to hold off this potential attack Apple can pull. It’s a very big thing and I think that Sony and Microsoft need to get behind this as soon as possible. It’s a big step, but potential a huge opportunity for Apple and everyone else. Want to know about apple next launch, click here to know more.